Chullin 66a ~ Do Swordfish have Scales (and are they Kosher)? A fish is only kosher if it possesses both fins and scales. What happens if the fish only grows scales when it matures, or if the scales fall off as it is being netted? This is question is discussed in today’s page of Talmud. Rav Shlomo Machfud, Rav of בד"צ יורה דעה examining a swordfish for evidence of scales, Tiberias 2010. © 2010 by David Willner for Foundation Stone. All Rights Reserved. The Sages taught: If a fish does not currently possess scales but will grow them after a period of time, such as the sultanit and afiyatz fish, it is permitted. Likewise, if it has scales now but will shed them when it is caught and rises from the sea, such as akunas and afuna, ketasfatiyas and akhsaftiyas and otanas fish, it is permitted. Let's assume that the identification of the אכספטיאס, the akhsaftiyas as the swordfish is correct. All fish will shed some scales when they are thrashing about in a net or fighting at the end of a line. In this regard the swordfish is no different to any other fish. But at first blush, the suggestion that it would loose all its scales when pulled from the water seems rather unlikely. Thanks to modern science, we can better understand the Beraita's claim. It's not that the swordfish looses its scales when removed from the water; rather, the scales of the adult fish are buried deep in the skin, giving it the appearance of having lost its scales. — Govoni, JJ. West, MA. Zivotofsky, D. Zivotofsky AZ. Bowser PR. Collette BB. Ontogeny of Squamation in Swordfish, Xiphias gladius. Copeia, 2004(2), pp. 391–396. Dr. Ari Zivotofsky is a Senior Lecturer in Bar-Ilan's Interdisciplinary Science Program. Aside from arguing cases about the status of Jerusalem in front of the U.S. Supreme Court, he has spent considerable time and energy pondering both the kashrut of the swordfish, and the anatomy of swordfish scales. He was one of several authors who published a study in 2004 with the playful title Ontogeny of Squamation in Swordfish, Xiphias gladius. Their study noted that "scales first appear on the abdomen of larval Xiphias at 6 mm standard length. Thereafter, large scales with a single spine increase in number anteriorly and posteriorly in a row along the abdomen and ventral margin." Photomicrographs of the integument and scales of Xiphias gladius. 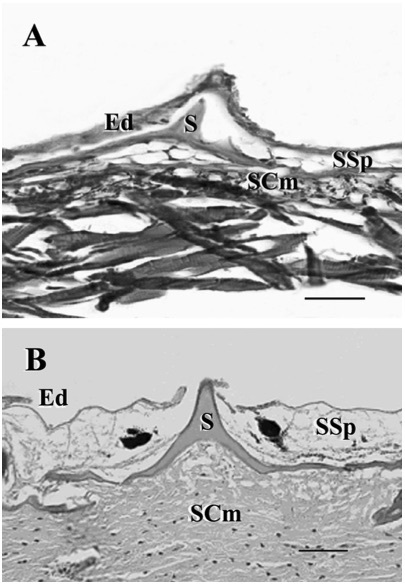 (A) The integument with scale (S), epidermis (Ed), and dermis with stratum spongiosum (SSp), stratum compactum (SCm) of a 22.2 mm larvae (scale bar 63 m). (B) The integument of a 330 cm adult (scale bar 45 m). From Govoni, JJ. et al. Ontogeny of Squamation in Swordfish, Xiphias gladius. Copeia, 2004(2), pp. 391–396. The confusion in the literature about the presence or absence of scales on adult Xiphias owes to the thickening of the dermis above the scale as larval and juvenile Xiphias grow. The result is that only the tips of the scale spines protrude in adults. Scales are often fractured and abraded when fish are caught and processed by the fishery. The cuticular layer of the integument is also covered with a thick layer of mucus, secreted by a network of mucous canals within the epidermis. This mucus lubricates the integument and renders scale spines less conspicuous. And so modern biology supports the claim, found in today's daf, that when adult swordfish are caught they appear to be without scales. So is the swordfish Kosher? The presence of tiny scales does not automatically give a fish a kosher status. Biological evidence of tiny or buried scales may, or may not be of consequence in Jewish law. Way back in 1968, Rabbi Moses Tendler of Yeshiva University wrote a polemic in The Jewish Observer, arguing that under no circumstances could the swordfish be considered kosher. Among the "facts - halachic and scientific" on which he based his opinion was this: "With growth the scales disappear and the larger fish including those sold in the market have no scales." We have seen that this is not the case. Later, he wrote that "in no place in the Talmud or the responsa literature is there any reference to a deviant: a fish that has scales as a juvenile but not as an adult." This may indeed be so. But as we have seen, the swordfish does not loose its scales. It buries them. The kosher status of the swordfish is a complex question. It involves anatomy, biology, history, halakhic responsa and local tradition. If you want to learn more, you can read Rabbi Tendler's 1968 article here. Avi Zivitofsky published a lengthy (53 pages!) and comprehensive history of the question in 2008. He focussed less on the scientific issues and more on the historical and halakhic ones, and you can read it here. Print them both up and enjoy reading them over Shabbat, together with a tasty fish dip. Like herring, or ketasfatiyas. Scales of Xiphias gladius. (A) Photograph of the ventral aspect of a pre-served larvae 114 mm long (scale bar 1.5 mm). (B) Photograph of a cleared and stained biopsy of the lateral flank of a 150 mm larvae (scale bar 0.3 mm). (C) Photograph of a cleared and stained biopsy of the lateral flank of a 102 cm juvenile (scale bar 0.6 mm). From Govoni, JJ. et al. Ontogeny of Squamation in Swordfish, Xiphias gladius. Copeia, 2004(2), pp. 391–396.